Acer to launch 7-inch Tablet PC Acer ICONIA A1013G version, the body also has a 7-inch touch screen, 16:9 screen resolution of 1,024 x 600pixels, in addition to be able to let your fingers on the screen on tap function, operation more convenient and direct more emphasis to carry out the practical performance Whether you want to visit, play games, watch videos, contact communication can be realized easily. Plus 410g lightweight design than pocket tablet book, leaving the player in one hand can grasp. Acer ICONIA A101 with Android 3.2 Honeycomb operating system, with NVIDIA Tegra 2 1GHz dual-core processor, 16GB eMMC and 1GB of RAM, in addition to planning individual to act with Google Apps integration services, while built-in Acer Day Planner application can easily calendar, as well as to facilitate the operation zone shortcuts or Acer Ring console has excellent peripheral link port, through proprietary Acer clear.fi (Acer digital cloud system), wireless network links within the family, easily connected in series with the DLNA certified 3C merchandise, enjoy family small cloud, consumers can be used with the products of the appropriate size, easy to enjoy the convenience of technology. Acer ICONIA A101 is equipped with a rear 5 megapixel LED flash camera with front 2.0 megapixel video camera, can be used at any time of the shooting or video conferencing. 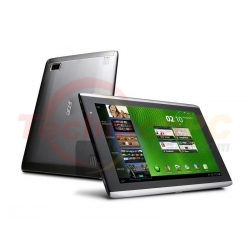 Acer Iconia A100 is also built-in Wi-Fi 802.11b/g/n and Bluetooth, and GPS; There multivariate expansion port, micro USB, mini HDMI, microSD complete transfer function can meet the players for audio and video playback and data storage needs.